Subcontractors on a construction job occasionally need to fight for payment from the prime contractor. Many property owners are unaware of the participation of lower-tiered contractors on the job. 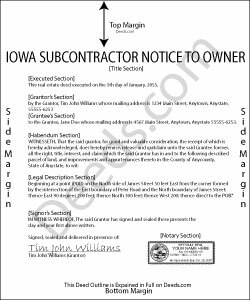 These subcontractors can claim mechanic's lien rights against the property owner even if the owner paid the contractor in full. However, this right only exists if the owner is served proper notice. In turn, after receiving the notice, the owner can rightfully withhold payment from the contractor to ensure these other parties are paid as to avoid any liens against the owner. A payment to the original contractor by the owner of any part or all of the contract price of the building or improvement within ninety (90) days after the date on which the last of the materials was furnished or the last of the labor was performed by a subcontractor, does not relieve the owner from liability to the subcontractor for the full value of any material furnished or labor performed upon the building, land, or improvement if the subcontractor files a lien within ninety (90) days after the date on which the last of the materials was furnished or the last of the labor was performed. I.C. 572.14(1). In the case of an owner-occupied dwelling, a mechanic's lien is enforceable only to the extent of the balance due the principal contractor by the owner-occupant prior to the owner-occupant being served with the notice specified in subsection. I.C. 572.14(2). This notice may be served by delivering it to the owner or the owner's spouse personally, or by mailing it to the owner by certified mail with restricted delivery and return receipt to the person mailing the notice, or by personal service as provided in the rules of civil procedure. Id. The Notice to Owner contains: 1) the name of the owner, 2) the address of the property charged with the lien, 3) the name, address and telephone number of the lien claimant, and 4) a statement that the individual serving the Notice may have lien rights. I.C. 572.14(3).